LUCENA CITY – Quezon remains at the top heap in terms of agricultural productions in the CALABARZON (Cavite, Laguna, Batangas, Rizal and Quezon) region. This was disclosed by Quezon provincial agriculturist Roberto Gajo citing data from the Phil. Statistics Authority which show that Quezon has 42% in palay production, 75% in corn production, 26% in fruits, 86% in coconut and 62% in vegetables as the province’ share in agricultural productions in the whole region. “Ibig sabihin, sa lawak po ng mga lupain ng Lalawigan ng Quezon na pinagyayaman ng ating mga magsasaka, nagbigay ito ng kongkretong resulta pagdating sa antas ng produksyon,” said Gajo who is concurrently the provincial government administrator after being appointed by Gov. David ‘Jayjay’ Suarez to the post vacated by Rommel Edaño who has filed his candidacy to run for mayor in his hometown of San Francisco. To maintain high level of agricultural productions in the province the Office of the Provincial Agriculturist has implemented various programs such as organizational empowerment and extension services, production enhancement support program, farm mechanization and post-production management program and agri-enterprise development program. Gajo shared information on various activities being undertaken by the provincial government in connection with alternative measures to strengthen uses of coconut products beside copra such as production of virgin coconut oil, coconut sap sugra, lambanog, among others. This is in close coordination by the provincial government of Quezon with the Dept. of Agriculture and Phil. Coconut Authority. “Nais ng ating minamahal na gobernador, Gov. Jayjay Suarez, na hindi lamang produksyon ang pinag-uusapan dito bagkus tinitiyak natin ang kita ng mga magsasakang iniuuwi sa kanilang mga pamilya para gamiting pangtustos sa pag-aaral at pang-araw araw na pamumuhay,” Gajo told his co-employees during the recent Monday flag-raising ceremony at the ground of the old capitol building here. He said that under the Suarez administration, alternative livelihood programs are also being undertaken for the small farmers in Quezon such as Quezon Herbal Program to promote the production of herbal plants for medicinal uses. 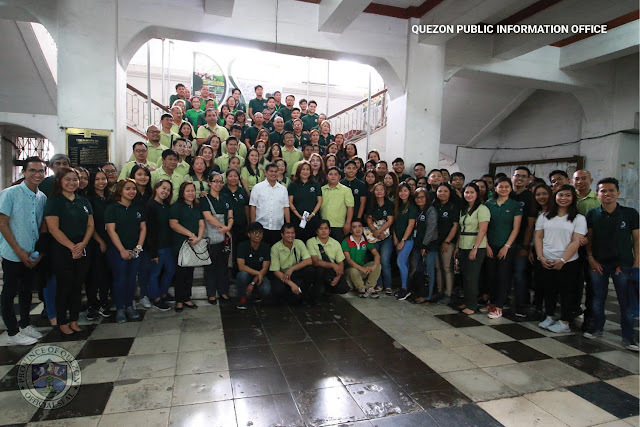 He also mentioned the Quezon Herbal Pavilion located at Quezon National Park in Atimonan which after a year since its establishment has listed 15,000 visitors and tourists and where various livelihood development seminars and lectures are conducted. Gajo disclosed that his office has been going around the 4 districts of the province to disseminate information on crop insurance coverage from Phil. Crop Insurance Corp.
“Ang ating gobernardor ay tumutulong para sa coverage ng crop insurance noong ating mga magsasaka. Alam naman natin na ang mga trahedya pagdating sa sektor ng agrikultura ay direktang nararamdaman lalo na ang climate change na ang pinaka-bulnerableng sektor dito ay ang sektor ng agrikultura at pangisdaan.” Gajo said.